Next door to their home is Pete Kaiser’s dog-yard, which used to belong to his father. “One dog, and pretty soon you need two dogs because kids are getting bigger, and so you need three dogs, and then five or six dogs so dad can actually train them to behave, and then, you know, they liked it,” said Ron. 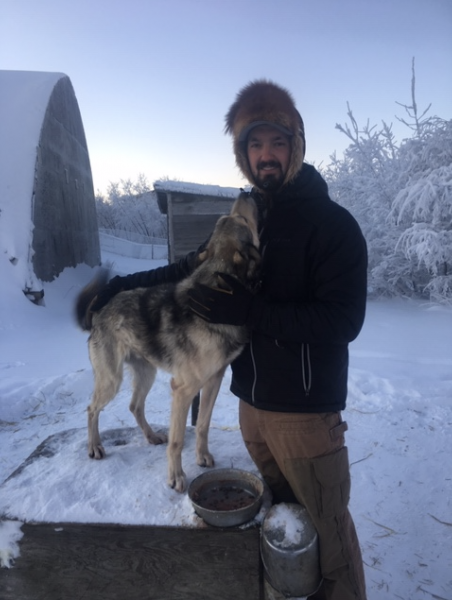 “He was sitting up there in Fairbanks saying, ‘I really don’t want to go to school, I want to run dogs.’ I was, ‘Okay, might as well come do it then,’” said Ron. “When I decided to mush full-time and really race and make a go of it, I was fortunate to have a good seasonal job,” Pete said. “He’s a local guy who is locally sponsored, for the most part. His helpers are mostly local, and he’s able to compete against and win against the biggest teams in the sport,” Angstman said. “There were a lot of springs being completely broke and starting work again and winning some money, putting it all back into the dog program again. But with some of that racing success comes sponsorships,” said Pete, who now has a total of seventeen sponsors. “If I were to get out of dogs right now, it would be just odd not to have a yard full of dogs to go feed every night. It’s just such a routine you get yourself into every morning,” Pete said.